The KORE3 Big-Brake Front Caliper Bracket Kit for the 4th generation GM F-Body applications adapts high-performance, high-quality, 5th or 6th generation Corvette (C5/C6) brake components to your LT1 or LS1 Camaro or Firebird. 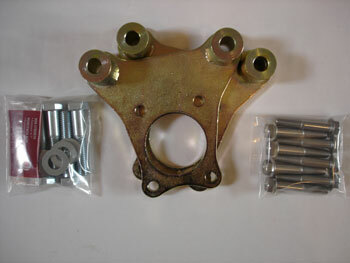 KORE3 GM Kit is designed for 1993-2002 GM F-Bodies only. Kit is fully compatible with the factory ABS. Kit installation requires minor, irreversible spindle modifications with basic metal fabrication tools. All necessary modifications are detailed in the instructions. 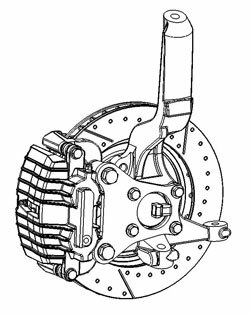 Minimum �17" wheels are required for caliper to wheel clearance. 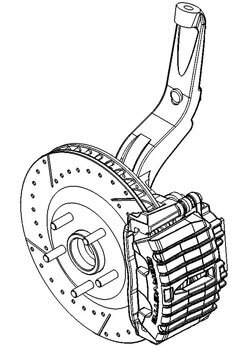 All 1996 and newer OEM F-Body �17" wheels will fit over the C5/C6 325mm big-brake kit without spacers, however not all aftermarket �17" wheels will fit. Please verify fitment prior to ordering using the appropriate KORE3 fitment template. Wheel fitment is the buyer's responsibilty. Please contact us if you have any questions regarding your specific application or the proper use of the templates.